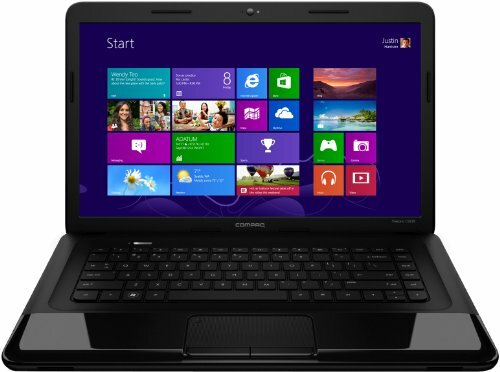 Below is our review of the Compaq Presario CQ58 250SA, a 15.6" laptop, featuring 4GB RAM, 750GB hard drive and Windows 8. Whilst compiling this review, the first thing we felt the need to point out was the price of this laptop. With a RRP of around £349, and a current sale price of £280 (at the time of writing) - please bear in mind that this laptop is not going to compete with more expensive notebooks in terms of computing power. However not everyone needs a notebook that can run the latest games at the highest graphical settings - some of our readers are simply after a functional laptop that can surf the web, check e-mails and carry out basic tasks in a reliable fashion. If this is you, then this laptop may well be suitable for you. Measuring 37.6cm by 24.7cm by 3.1 cm, and weighing in the region of 2.4kg, it's pretty portable for a budget laptop - often cheaper laptops are larger and weigh more due to having to cut costs - not the case with this notebook. The exterior is finished in a shiny black gloss, covering the lid and also the surrounding area of the touch pad. This looks great, but can show fingerprints - so bear in mind that you may need to wipe it down every now and again to keep it all looking new and shiny. The 15.6" display offers a fairly good picture, with colours being rendered well, and the overall viewing experience being crisp and perfectly watchable. As with most laptops, it features an HDMI output if you wish to broadcast the picture on a large screen or monitor. Intel provide the processor, in the form of the Celeron B830, which runs at a rate of 1.8GHz, and is further backed up by 4GB RAM - a pretty good specification for the price. The hard drive fitted is 750GB, offering a huge amount of storage for a budget laptop, running at 5400 revolutions per minute. In terms of connections, HP have provided with numerous options: VGA, HDMI, Ethernet, a multi card reader, microphone, headphone, three USB ports, DVD drive and DC power input. The keyboard and touch pad both were comfortable to use, with none of our testers having any issues with either of these input methods. Even more impressive is the inclusion of the latest Windows 8 operating system - at this price range you could realistically expect the older Windows 7 to be the operating system - not the case here. So what did we think of the CQ58 250SA notebook overall? Pros: Very good specification for the price tag. Excellent value. Cons: None to speak of - for the low price tag we couldn't find any major issues. If you're looking for a sub £300 laptop then the Presario CQ58 250SA is a good bet - it offers a lot of computing power for it's relatively low price, as well as the latest Windows 8.